It can be a challenge for any educator to navigate the diversity of experiences, cultures, and learning that students bring to their school environments, but doing so is an essential part of helping students develop a sense of belonging in school. Eskolta teams have been thinking critically about how we can grow and help educators to address this challenge and create a meaningful learning experience for each student—especially those with a history of struggle in school. Last month, Eskolta wrapped up the latest cycle of our book club series—a biweekly opportunity for staff to come together and reflect on shared readings. During this year, we we read books by Ta-Nehisi Coates and Lisa Delpit and explored how teachers can better understand students’ cultural backgrounds to empower them to become engaged, independent, and skilled learners. 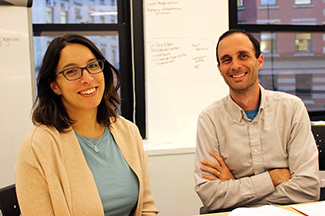 Adonia Dale, Eskolta’s Transfer School Alumni Fellow, sat down with Aaron Boyle and Nicole DeFino, senior school design partners and former transfer school educators, to learn more about their takeaways from discussing these readings with colleagues. Adonia Dale: What were your big takeaways from the readings on equity in the classroom? Aaron Boyle: I found myself reflecting on my own teaching experience where I, a white guy from a relatively affluent upbringing, taught at a school with 100 percent students of color coming mostly from low-income backgrounds. The frequency of that setup in schools across our city and around the country is one of the many artifacts of the institutional racism in our society. Our society discourages the discussion or really even the acknowledgment of those disparities, so the easiest way forward for a teacher from the dominant culture is to just politely ignore them. But racial dynamics don’t go away when ignored, and if the teacher has opted out of considering them, that pushes them squarely onto the plates of students to deal with while trying to learn. Nicole DeFino: I walked away thinking about two main things, both of which came up while I was a transfer school teacher. First, it is critical to have high expectations. Second, connecting to and understanding students’ cultures and identity is vital to teaching them. These two pieces are very much connected. Teaching is all about relationships, and understanding and valuing someone’s identity is critical to any relationship. Strong relationships are built on mutual respect. If your expectations of someone’s ability are low simply because they were unsuccessful in their previous high school, how are you truly respecting them? I loved my students and I showed them that love by building a classroom of high expectations where they could explore, share, and develop their identity. AD: When you were working in a transfer school, how did you engage in discussions about equity that led to greater understanding between you and your students? AB: Building positive cross-race connections was one of the areas I had to figure out a lot on the job that my teacher training didn’t address, but I learned a lot from my students and experienced colleagues as I tried to do better. I was very fortunate to work in a school where discussing racial dynamics was an established part of the school culture. That helped me be explicit about race and racism and put myself out there as someone willing to think about it. But the most important thing was pushing myself to constantly deconstruct the stereotypes and prejudices I was socialized to have, and instead seek out opportunities to learn about my students as individuals and build personal connections with them in ways they felt authentically seen and heard by me. Then, for instance, when it came to me having to confront students about not completing work or give reminders about classroom rules, it could hopefully be perceived less as “Here’s another white guy claiming power over me as a person of color,” but more as “Here’s someone who knows me and is trying to help me do what I need to do,” which obviously makes for a more productive interaction. I learned that I couldn’t fall back on any benefit of the doubt for that, but had to get there by deliberately grappling with racial dynamics and my place in those as a white person. AD: Have you seen ways teachers successfully brought in student voice or student expertise into their classroom? If so, did it encourage more student independence? AB: I’ve seen a lot of teachers design their courses around themes related to students’ lives and backgrounds, which often involves an extra layer of curriculum development beyond standard materials. I think teachers usually see it pay off, though, in greater student engagement, deeper classroom discourse, and more meaningful learning. Some teachers start off the year gathering student questions and then design units of study around those questions. Others set up flexible project options where students get to pick their topic and decide the way that they’ll demonstrate their learning, be it through a presentation or a piece of art. I do think this encourages more student independence when they can see themselves in their studies and feel a sense of value around why they are working on a particular project. Fostering that independence is an important step in preparing our students for their next steps after high school. ND: I developed a poetry class that engaged students and got them to share parts of their identity. They were heard in my classroom. They were celebrated. The work they produced in that class was amazing; I still have all of it. While that course was fun and engaging on a creative level, during my post-trimester reflection, I feared I was still not preparing them for college, so I designed a course that had students reading two books and writing three multiple-page essays in twelve weeks. The kids thought I was crazy that first day I told them what we’d be doing. But I told them they could do it. And they did do it. Of course, it is not as simple as telling them, but I think they liked that the course was college-like. Each of the three essays focused on the revision process. Students owned this process and their learning. They kept track of where they needed to improve. I provided individualized support and feedback. They could be found reading their papers to one another, line by line, in order to revise them. AD: Which ideas from the readings will you take with you and apply to your work now? AB: It was interesting to read about this with Eskolta colleagues and reflect together on implications of its message for our work in which we aren’t really interacting directly with students, but supporting teachers who do. What are the ways that we can be allies to teachers who are trying to confront racial inequities? How can we help school teams who are not demonstrating awareness of racial dynamics build more consciousness in productive ways? ND: Having high expectations and learning and valuing the cultures of others are things you can apply to any relationship and team.